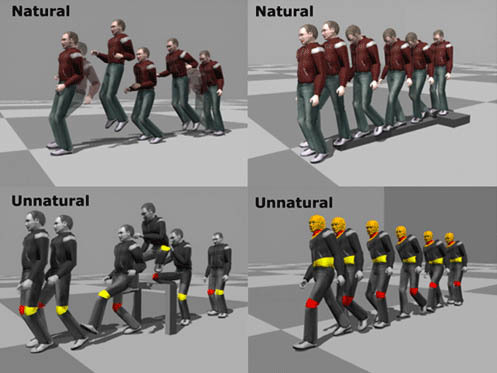 In this paper, we investigate whether it is possible to develop a measure that quantifies the naturalness of human motion (as defined by a large database). Such a measure might prove useful in verifying that a motion editing operation had not destroyed the naturalness of a motion capture clip or that a synthetic motion transition was within the space of those seen in natural human motion. We present an ensemble approach to attack this problem. In our approach, we first hierarchically decompose human motion into its constituent parts (individual joints, limbs, and full body) and build a statistical model of each one using existing machine learning techniques such as mixture of Gaussians (MoG), hidden Markov models (HMM), and switching linear dynamic systems (SLDS). We then combine these models into an ensemble model for classification of the motion as natural or unnatural. We also implement a Naive Bayes (NB) model for a baseline comparison. We test these techniques on motion capture data held out from a database, keyframed motions, edited motions, motions with noise added, and synthetic motion transitions. We present the results as receiver operating characteristic (ROC) curves and compare the results to the judgments made by subjects in a user study. Liu Ren, Alton Patrick, Alexei A. Efros, Jessica K. Hodgins, James M. Rehg (2005). A Data-Driven Approach to Quantifying Natural Human Motion. ACM Transactions on Graphics (SIGGRAPH 2005), 24(3).